Two weeks ago, a study of former Biggest Loser contestants went viral that showed that not only did almost every contestant gain most, if not all, of their weight back, but also that their bodies seemed to fight against the weight loss by slowing their metabolisms. From these observations, the researchers concluded that this is why our society has had a hard time making headway in the obesity epidemic and that it is a “basic biological reality” that once you get below your “initial” starting weight, your body will always fight to get to back to it. I feel like there are so many things I could talk about, but I’d like to hit on the most important and then suggest another great article on the subject. “His routine went like this: Wake up at 5 a.m. and run on a treadmill for 45 minutes. Have breakfast — typically one egg and two egg whites, half a grapefruit and a piece of sprouted grain toast. Run on the treadmill for another 45 minutes. Rest for 40 minutes; bike ride nine miles to a gym. Work out for two and a half hours. Shower, ride home, eat lunch — typically a grilled skinless chicken breast, a cup of broccoli and 10 spears of asparagus. Rest for an hour. Drive to the gym for another round of exercise. There are many problems with this routine: the severe amount of stress on the body, the lack of dietary fat in the diet, the lack of overall calories, the lack of rest and recovery, the overall extreme and unsustainable nature of it. Any of these things by themselves can hinder fat loss, but let’s just look at one…. These people were literally starving themselves. In that condition, it doesn’t matter how much excess fat you have, all your body knows is that it’s starving and won’t be able to survive on this amount of calories forever. Of course the body is going to fight back – and one of the first things it will do is slow down the metabolism so that it can conserve energy and store up as many calories as possible for later. 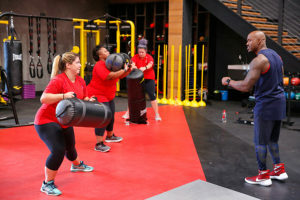 While on the show, they had enough motivation to push through the body’s survival mechanisms but once the pressure of competition went away, their bodies took over. Given the extremes that they took things to and the length for which they did it, we are talking about severe trauma and damage not just to the metabolism but to the mind as well…. Have you ever heard of how slowly and delicately they have to reintroduce starved people to food? It’s a long, slow process to restore the body and metabolism and even longer to fix the mental effects. Take, for example, these men in the 70’s who voluntarily went through a short time of semi-starvation for research. During the starvation period, food became the sole source of satisfaction and motivation while everything else seemed to fade away. Even during the 20-week rehabilitation period, while the subjects’ physical recovery slowly progressed, their mental states continued to decline. Eight months after the study, the men reported lingering side effects like binging to the point of sickness and the inability to distinguish between gnawing hunger and normal appetite. This is what the Biggest Loser contestants put themselves through, except that they believed it was good for them. They tried to fix years of struggle and habit in 6, maybe 7, months. They went from one extreme to another with no rehabilitation period, no idea of what a normal or healthy relationship with food or exercise should look like, and no working through the spiritual and mental issues that got them to where they were in the first place. These researchers are acting like this is a completely normal and healthy way to lose weight and then blaming it on biology. This is the real problem. Strict diets, extreme exercise programs, and severely low amounts of body fat are what we call healthy these days. There is so much more to health than just a certain look or weight and yet there’s no talk of the spiritual or mental side of health, of patience and your body’s timeline, of doing and eating things you love in order to make it something you can and want to continue doing, or of finding a more meaningful purpose or reason to get you through the hard days. Our definition of health, our reasons for pursuing it, the ways we try to attain it are shallow, unrealistic, and so utterly unsustainable! This is what we’re all up against. THIS is why sustainable weight loss is so elusive for so many. Yes, our bodies do get comfortable where they’re at and will fight to stay there. The more extreme the change, the harder the body will fight back. This is why so many health professionals are becoming advocates of smaller, more gradual, changes. It’s not to lure more clients in by telling them what they want to hear. 😉 It’s because we truly want to help people and this is what works long-term. Making changes that will fit into your life and that you can happily stick with forever. You’ll probably have to do things differently than you have in the past and it will probably take longer than you want it to, but it IS possible. You are not doomed to stay where you are forever! Are you struggling to believe it? Here’s a little extra encouragement from someone with a lot more experience, Dr. Yoni Freedhoff: I’m an obesity doctor. I’ve seen long term weight loss work. Here’s how.